Is Series Against San Jose a Must Win for Vancouver's Alain Vigneault? Is Series Against San Jose a Must Win for Vancouver’s Alain Vigneault? The Vancouver Canucks limped their way to a fifth straight Northwest Division title during this lock out shortened season to secure the third seed in the West. They now take on the San Jose Sharks in the first round of the Stanley Cup Playoffs for the second time in three playoffs. The last time, in 2011, a trip to the Stanley Cup Finals was on the line. For Canucks bench boss Alain Vigneault the stakes this time around may seem just be as high. 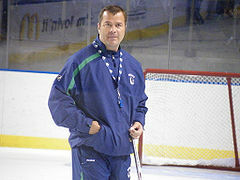 It goes without saying that Vigneault has been the most succesful head man in Vancouver history. He has won two President’s Trophies, six division titles and came within one game of winning the Stanley Cup. Nobody has been better. He helped transform the Sedins, Alex Burrows, Ryan Kesler and Kevin Bieksa into top notch NHL players. He has turned the Canucks into perennial contenders. Despite all that he may be coaching for his job over the next couple of weeks. It’s been two seasons since Vigneault guided the Canucks to the Finals. In those two years the team has played at an elite level at times while looking like they had better plans at other times. Last season they bowed out to the Kings in five games and Vigneault may not be able to survive another first round playoff loss. Vancouver now faces a Sharks team that resembles themselves in many ways. They have a roster with older top line players who have been strapped with the ‘under achiever’ label. They are a desperate team and beat Vancouver in all three meetings this season. Beating Vancouver in this series would not shock anyone. Pro hockey, and sports in general, are a ‘what have you done lately’ prospect. The Canucks imagine themselves as a Red Wings type of franchise. One that never seems to have to rebuild, makes the playoffs each year and makes deep runs. Two straight lack luster first round losses will cause fingers to point from all direction. When that starts happening they only seem to target the guy behind the bench. If Vancouver were to lose to the Sharks would it be Vigneault’s fault? It is hard to argue that it would be. The Canucks have had their share of injuries this year and headed into Wednesday’s Game 1 they are still banged up. Bieksa just returned from an injury, Chris Tanev’s status is still up in the air and even Cory Schneider’s availability is not a sure thing. Last season Vigneault and the Canucks had to try and beat the red hot Kings without Daniel Sedin for the start of the series. Certainly Vigneault has had his hands tied the past two seasons with injuries and it would be short sighted to lay the blame for anything at his feet. Yet, that is how it happens in the NHL. If they were to lose to San Jose general manager Mike Gillis would start to feel the pressure. His roster is beginning to age and is showing signs of breaking down. The Canucks have seemed to not have a sense of urgency the past two seasons despite their divisional championships. Changes will have to come and one of the easiest to make would be to change the guy behind the bench. There has been a great deal of speculation on internet message boards and talk radio about whether or not the team has begun to tune out their coach and that is the reason the team has been inconsistent the past two years. While the more likely reason are injuries only the guys in the room know whether that is true or not but there have been some signs. Vigneault seemed to criticize Ryan Kesler last season over injury concerns and then there was the handling of Roberto Luongo in Saturday’s season finale. Are these signs that the love affair between team in coach is on the brink? Maybe, maybe not? But if the Canucks can not advance past the Sharks these criticisms will start to bubble up again and the pressure for change will be great. The best thing Vigneault can do for himself, and the team, is to find a way to guide his battered roster past a Sharks team that also is trying to avoid a second straight first round defeat.